The year the Cold War was extended by the British Cod War, illustrating that it is usually smarter to pick on someone smaller than yourself. In 1958 Iceland unilaterally extended its fishery coastal limit from 4 to 12 miles; Icelandic gunboats went head to head with the might of British warships in the North Sea. The dispute was met with almost complete indifference by cod, who declared they were not at all fussy who caught them. 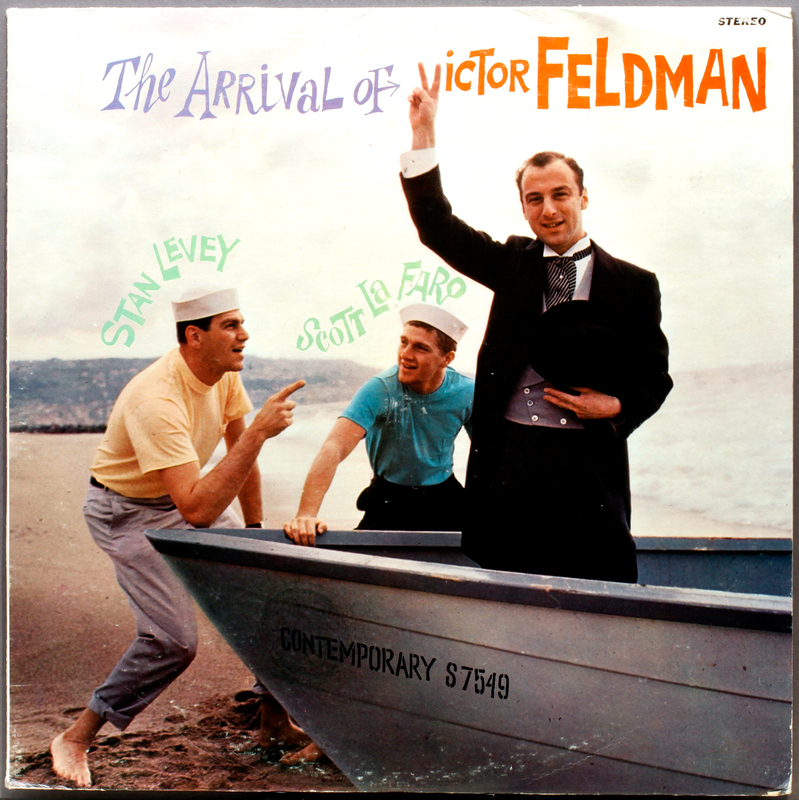 Victor Feldman was a well recognised figure in the US Fifties jazz scene such that many are surprised to learn he was British musical émigré, arriving in the US in 1955. On this debut LP for Contemporary, Feldman is pictured stepping ashore from his rowing boat in typical British sailing gear – morning coat waistcoat and tails, greeted by Levy and La Faro cast as two sparky American navy deck hands. No cod were involved, as far as we know, though the presence of other fish can not be ruled out. Feldman’s victory sign, putting the Churchillian “V” in Victor, may have been a timely warning. Perhaps the US should have taken note of the plucky Icelanders action, and established a 12 mile music exclusion zone, seeing off the Brit invasion at this early stage. By the time the Beatles and Stones arrived at the beach head, it was all too late. Feldman was much sought after on both vibraphone and, with his Bill Evans Wynton Kelly approach, on piano. Selections here offers one piano piece, and a frantically fast-rendition of Gillespies’ composition Bebop on vibes, showing the instrument is capable of more than cool colourings. Feldman was later to become the piano voice of the Cannonball Adderley Quintet, however it is the presence of Scott La Faro here that is a major attraction of the record. That and the opportunity to listen to Roy DuNann’s spacious stereo production. Characteristic Lester Koenig Stereo matrix – LKS number and stamper code – original US Stereo pressing, deep groove, green/gold labels. It’s always nice to chance apon US stereo Contemporary originals, given the issue of Contemporary Vogue licensed in the UK being almost exclusively mono releases. 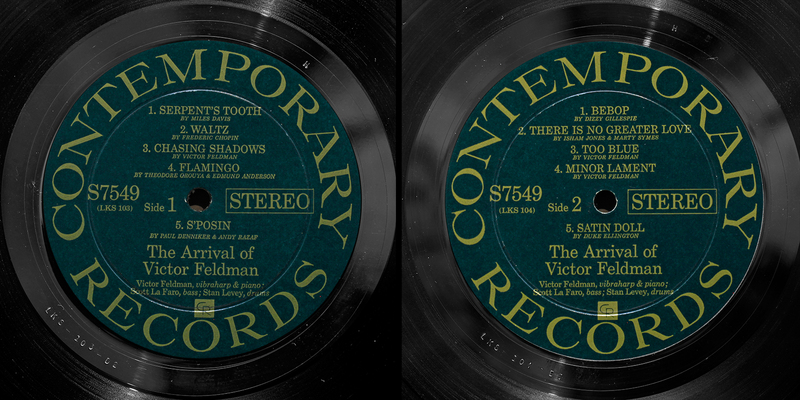 When people argue the merits of the mono and stereo editions, important though that discussion is, its easy to forget that for us in the UK it is often just a case of whatever is on offer, and usually that is mono, so you have no choice but to take it. There is a scene in the classic French film Amelie. Arriving one Sunday at a Paris railway station, Amelie, who has dedicated herself to secretly making people happy, notices a down-on-his-luck beggar. She offers him a ten franc note. He looks down at it for a moment, and promptly hands it back to her, with a cheery smile – thanks, but I don’t work Sundays. This entry was posted in Contemporary, Victor Feldman and tagged Contemporary, Roy Du Nann, Scott LaFaro, Stan Levey, Stereo, Victor Feldman by LondonJazzCollector. Bookmark the permalink. 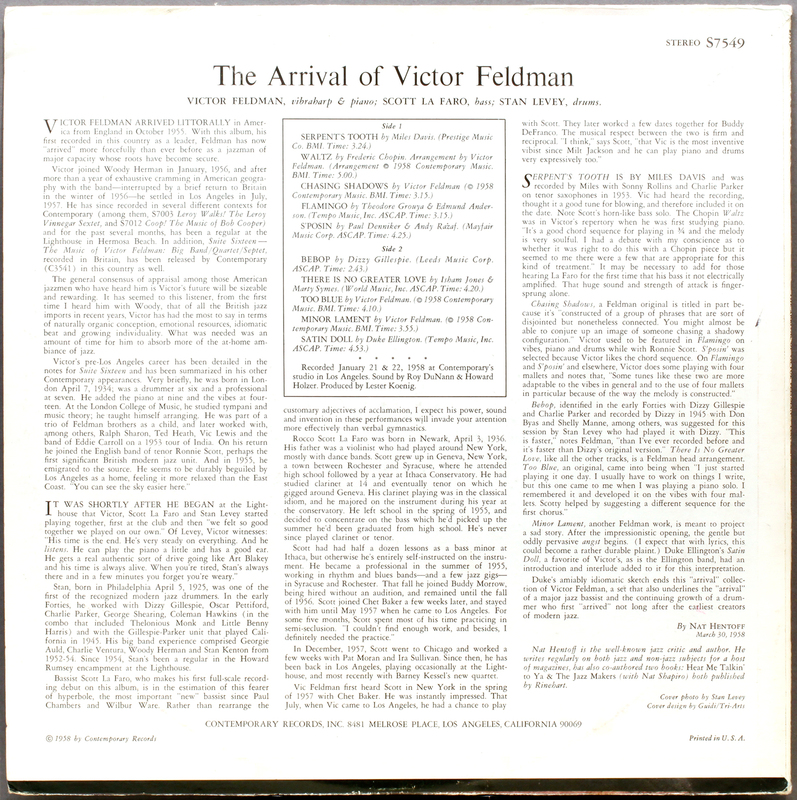 I stumbled at Discogs over this copy: https://www.discogs.com/Victor-Feldman-The-Arrival-Of-Victor-Feldman/release/8266600. Was it released in the same year as the US release as submitter stated. It has a different Cat#. Submitter thinks the Label should be “Contemporary a division of Vogue”. The Discogs description is incomplete, since the original issue of this remarkeable album on US Contemporary (C 3549) is not even mentioned, only the stereo re-issues. I would think UK Vogue needed some time to prepare the UK issue, so 1959/60 seems a good guess. One may find something like a “Bill Evans approach” in Victor Feldman’s playing, as LJC does. But Bill wasn’t as laid-back and relaxed as Victor was. To these ears, the latter was more like Wynton Kelly in his rhythmic approach. His playing was both bluesy and cool. And the coolest things he played were with Miles on “Seven Steps To Heaven”. Oh – lest I forget… “The Arrival” is a great, great record, one of my favourites. And a great pressing, this one. But I’m almost certain most of you will be familiar with all this.